It’s been too cold here in Ohio for way to long. All of us are getting cabin fever and the dogs are quite uncontrollable so I keep having to find ways to keep us all content. Frankly most of these generally involve craft beer and comfort food! Today being no different in terms of weather or emotion, I woke up craving grilled cheese; a food that I truly love. The problem is that lately it doesn’t love me. I’ve given up gluten and I don't regret it because until recently there’s been nothing available to me that could even remotely begin to resemble bread in my book. That is until last Saturday when I discovered a new and quite magnificent gluten free baker at my local indoor farmers market. Their name is Uncommon Grains. Watch out for them. They’re a cottage business right now, but I don’t think that they will be for long. Any of you who have tried gluten free bread in the past know that it is essentially way too dry and for the most part a totally tasteless, crumbly and strange substitute for bread .The bread that I bought today is amazing; flavorful and chewy with perfect air pockets and blessed with a crust that would make a Parisian expat weep. Today I went back specifically for their rye loaf, because I was sure that it would make a perfect grilled cheese sandwich. Their rye loaf is studded with caraway and has the most amazing rye/pumpernickel bread aroma. I thought that it would be perfect with the artisanal Colby cheese with dill that I’d bought the same day. We are so lucky in Cleveland; our origins are in farming as well as industry so incredible farm to table products are available all year round. We’ve got inner city farms, year round CSA’s and lots of farmers markets going on all of the time. There’s never a shortage of good fresh food! After picking up some fresh organic whisky scented sausage, young carrots and some chocolate peanut butter hemp seed bars I went home happy and ready to cook! A few drops of neroli , sage and vanilla essential oil rubbed through my hair (in case a special someone came into the kitchen!) and I was ready! 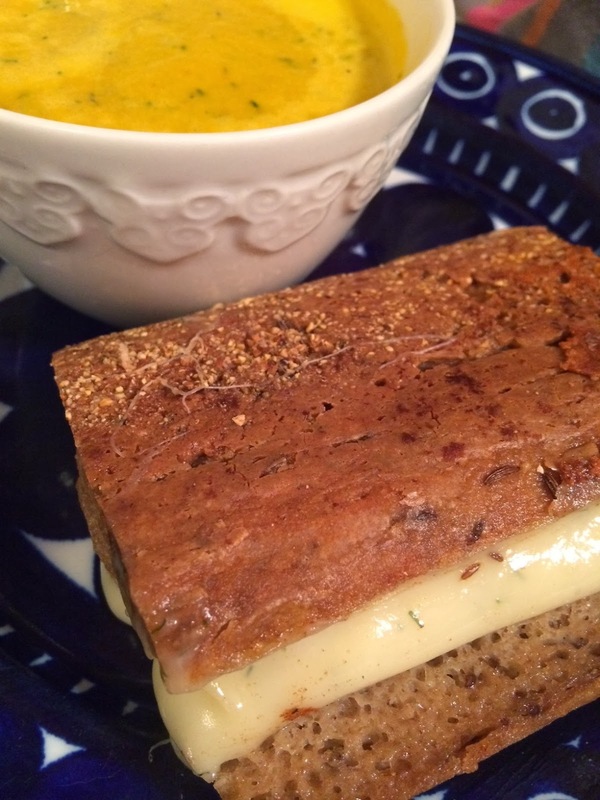 Of course any grilled cheese worthy of the name needs some soup to dunk it in, so I played with the dill theme and came up with a savory fresh buttermilk, carrot, dill and ginger soup. My kitchen smells like a buttery on this perfect midwinter day and all of the dill is scenting the air with its cool, crisp fragrance. The caraway seeds from the bread are smoldering like fine incense and the Colby is melting over the edges of the toasting bread. There are tall glasses of cold, freshly pressed winter cider. When I take it all down to Jim, he takes a bite and shuts his eyes, smiles that glorious smile of his and for once, I don’t mind the cold nor the falling snow at all. What do you like to eat on a cold winters day? Any thoughts on grilled cheese? If you want my recipes just let me know in the comments and I'll send them straight to you!